Roberta Wagner is an artist, gardener, aspiring yogi, and bank consultant. I love art that captures the unseen qualities of space and time. I am inspired by calm that still holds movement; like a prairie swaying in the North Dakota wind, like tidal patterns on the water of Puget Sound, or windswept clouds on an otherwise clear day. Decades ago, I found "The Internal World of Gemstones" by E. Gubelin, which contains color photographs of gemstones under microscopes. Their dazzling color, magnificent crystalline structures, and fractal imagery have been an inspiration ever since. I love the fact that images from under microscopes and photos from space appear to be very similar. I love ceramic glazes that capture that universal quality of both outer space and Earth closeup. I hope my work is just abstract enough that it will remind me of Puget Sound and you of a Venice lagoon. I studied ceramics with Vally Possony, a master potter in the Hamada tradition, for twelve years off and on. She became an aesthetic mentor to me, teaching me about how to look at food, plants, pots, and flowers. 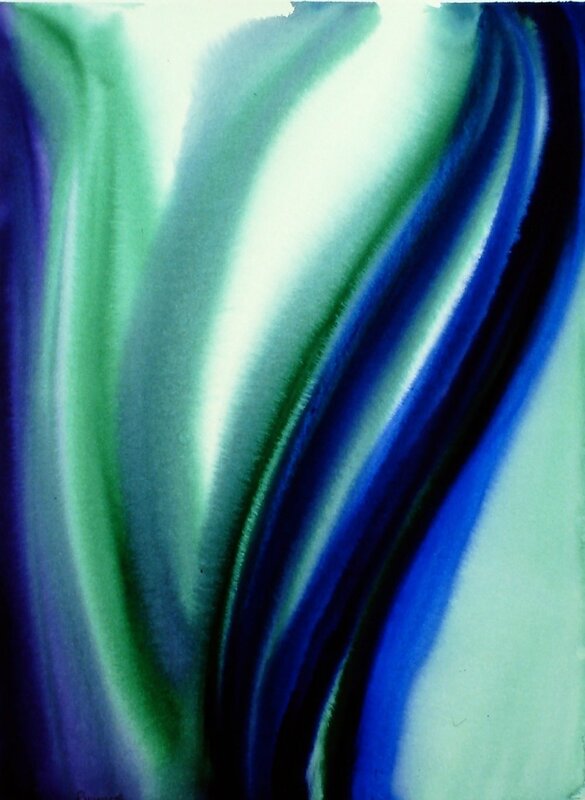 In 1986, I began painting to have more freedom with color than is possible with glaze. In 1994, I had my first gallery show at Alex Gallery in Washington D. C. Eleanor Kennelly, who wrote for Art and Auction magazine said Wagner creates "images of landscape, places imagined and remembered . . . Soft washes of color traced with luminescence (which) become the shifting tones of an evening sky, a marsh at dawn, or a prairie." I was thrilled. I moved between the two mediums, paint and clay, for years and in 1995, began an extensive study of glaze chemistry in order to be able to paint with glaze. I worked with clay primarily doing architectural ceramics for decades and completed some major commissions such as an 8' diameter fountain for the Lewis Ginter Botanical Gardens in Richmond, VA. I started to get tired of the dust and chemicals, though, and In 2012, I began to paint and dye cloth, embellishing it with beads and stitchery. My blog post Changing Mediums talks a bit more about that change. I have always loved gardens and was able to go to Japan in my early twenties and see the Kyoto gardens at cherry blossom time. Those gardens and the Japanese aesthetic have colored my work ever since. The concept of Wabi Sabi is dear to my heart. I stand in front of the blank sheet of beautiful Washi paper, brush in hand. Sumi ink, green gold and brown ochre watercolors have been watered down to a consistency I like. White acrylic paint is at the ready. Anne Truitt writes beautifully about the influence of being born with undiagnosed nearsightedness and its influence on her view of the world and art. She speculates that it is partially why she is attracted to abstract art. I have always loved trees and have sometimes crammed too many in a garden. When we lived in Virginia and had 11 acres, I dreamed of planting a birch tree wood. Sometimes we are saved from ourselves. It’s hard to believe but just a few short months ago, I was so frustrated with my art work that I was ready to give up on it all together. I kept trying to paint on canvas the way I paint on paper and would make a terrible mess. Then I had to clean up the whole mess. I’ve come to believe that time is on a different continuum when it comes to art. Think how long it takes for us mere mortals to truly see the Van Gogh’s of the world. On a much smaller scale our own artwork often needs time to settle, too. My garden has many plants that self seed. I love foxgloves and columbines and welch poppies. They can be quite invasive, especially the poppies. I have been warned to get them out of the garden. And perhaps some day I will wish that I had. But this past spring, I loved seeing where they had set themselves.